Somebody kill me now. I haven't had a cold since March of 2004, but while in Portland this past weekend some family members had the sniffles (you know who you are...:-) and since I'm long overdue for getting sick, the germs decided that I would make an excellent host. Anyway, I'm feeling kind of miserable and so all I wanted for dinner was soup--even though it was 78 degrees outside today. And as I type this post I'm having a big bowl of my mushroom barley and it is delicious! Afterwards, I'm going to curl up on the sofa with a big mug of herbal tea and crash for the remainder of the evening. Hopefully tomorrow will be a better day and I'll start my Thanksgiving series, I promise! Note: If you want to make this gluten free then substitute short-grain brown rice for the barley and cornstarch for the flour. You may need to add more thickener since the barley acts as a natural thickening agent. Drain barley and place in a sauce pan. Add filtered water and 1 tsp salt, bring to a boil and reduce to medium-low and cook for one hour until tender, adding more water if necessary. When finished drain barley, reserving 1 cup of cooking liquid and set aside. Heat vegetable stock to a boil, add dried mushrooms, remove from heat and let steep for 30 minutes or until barley is finished cooking. Drain vegetable/mushroom stock and set aside. In a large dutch oven or pot, heat olive oil and add sliced mushrooms and cook until golden brown, about 10 minutes. Add onion, garlic, thyme, salt and pepper to taste and cook for another five minutes until onions are soft. Stir in flour and mix well and then add 6 cups of vegetable stock, along with 1 cup of barley cooking liquid and bring to a boil. Next add celery, carrots, potatoes and bay leaf and reduce heat to medium-low and simmer for about 20-30 minutes for flavors to combine. Stir in barley and green peas and heat through, adding more stock if too thick. Check for salt and pepper and add more if desired. Remove bay leaf and garnish with minced parsley. never used barely but that i can find though I have regular brown rice on hand (Not short grain) can I use that? 1/4 cup dried porcini mushrooms... can i use my dried costco mix?! i figured since you're blog has not hit mainstream status yet i will bug you while i can! 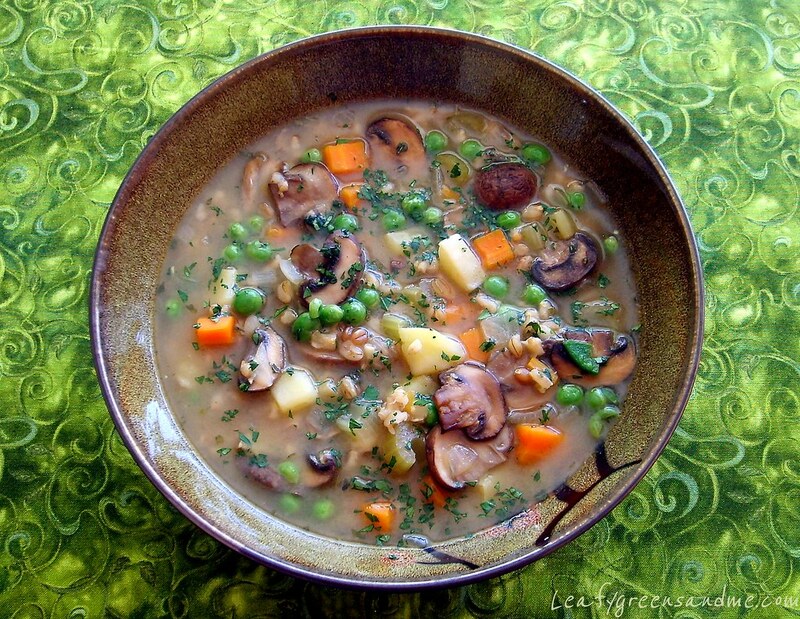 Barley has a high starch content and helps make the soup creamy. You can use regular brown rice and add more flour or cornstarch to thicken it to your liking. I always try to use fresh herbs instead of dried. However, if money is an issue by all means use dried, but use less. I would start out with 1/2-1 tsp dried and see how it tastes. You bet, you can use your dried Costco mix instead of the porcini. Remember if you want added flavor you can also grind them in your spice grinder and add to the soup as well. I'm not certain if my blog will ever go mainstream, I'm really not good at promoting it but I really appreciate you sharing my blog on facebook and your blog...you can bug me anytime!